Can EasyMatch QC automatically open a Job(s) when opening the software? Is there any way to have EasyMatch QC automatically open a Job(s) when opening the software? Yes, there is an option in the software to automatically have EasyMatch QC open a Job or a few Jobs when starting the software. To use this option go to Options/ Application Preferences/ Startup Defaults. The second option in the new window that opens is Choose the Default Job. Checking this box enables the feature. Then use the ‘…’ button to open Windows explorer which will list all of the available Jobs to choose from. You can choose one job or use the Ctrl key to select multiple Jobs. 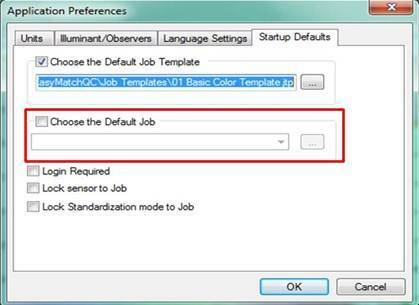 Click Open to save your Jobs selection and click OK in the Application Preferences window to save your settings. All of the Jobs you chose will now automatically open when the EasyMatch QC software is started. Please note that the more Jobs you choose to open upon start-up the longer it will take the EasyMatch QC software to open.